The voiceover guy sounds like the guy who did the voice for the Black Scorpion nearly a decade earlier. They never said the name of this man who stood outside the window, face painted white, donning a black hat and trenchcoat. But it was pretty weird, especially at the end when the boy's eyes went to all black. Low and behold though, we finally got to see the debut of "Seven" on an episode of Monday Nitro in November 1999. Dustin had a pretty cool entrance. Although Tony Schiavone said he'd never seen an entrance like this, but it was eerily similar to the Undertaker's with the flames and smoke. Although Dustin did "float" to the ring. I must admit I was surprised by the use of him in the air since this was less than six months after Owen Hart had fallen to his death at the Kemper Arena. But to be fair, he wasn't suspended above the ring, and wasn't really that high off the ground. 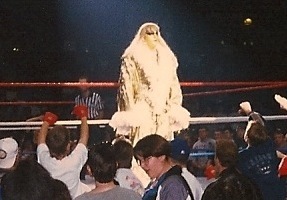 Of course, once he landed, Dustin took the mic and started to "shoot", saying the Goldust gimmick "sucked" and that the Powers That Be in WCW thought Dustin sucked and he needed to be "Seven". I love the reference to Uncle Fester, because he really did look like the Addams Family icon. I don't know if the plan all along was for Dustin to shoot on the gimmick or if it was a decision made after the silly vignettes ran. It seemed like a launch pad for Dustin to wage war on the Powers That Be. This "shoot" though was very similar to the one Dustin did back in the WWF a couple years earlier when he burned the Goldust costume. 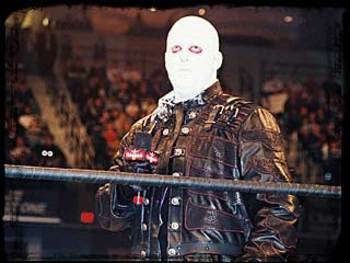 Personally, I always liked the Goldust gimmick. In fact, it's one of my favorites of all time. I'd say it gave Dustin an opportunity to set himself apart and gave him the separation of being "Dusty's son." 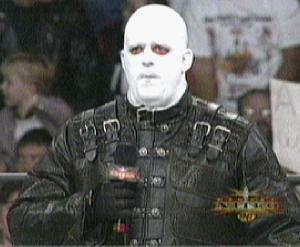 He worked it well, and nearly 16 years after his debut, Goldust can still pull off the character. Read a past post about Goldy by clicking here. 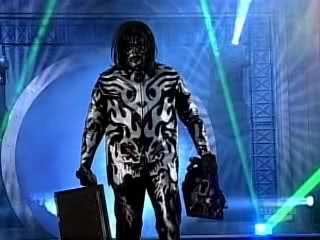 In addition to Goldust, who's had some dark moments too, Dustin played a strange character in TNA too. For those who didn't know he was Black Reign. Again, I think this was another extension of Goldust and another company trying to alter the gimmick somewhat because of Dustin's popularity with that character. Obviously darker, he carried a pet rat. Strange indeed. But back to the original subject here. 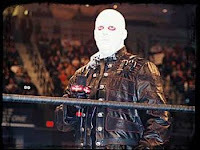 Seven was an unlucky number and gimmick for WCW and Dustin Rhodes. Glad he came back to the WWE as Goldust, it's a name we'll never forget.